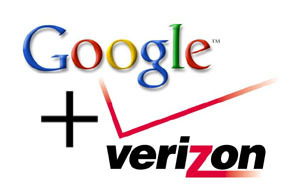 Mobile operator Verizon Wireless and Internet giant Google have announced a broad new partnership designed to put the Android platform and Android devices front-and-center in Verizon’s smartphone offerings. Although the announcement is short on specifics and long on smoothing over the historically rocky relationship between the two companies, a few things are clear: Verizon will be rolling out a number of Android devices in the near future (most likely with full support for the Android Market) and Verizon is positioning itself as a an open carrier where customers have a wide range of devices, platforms, and applications. Verizon is promising to unveil its first Android devices in the coming weeks, at least one of which will be from Motorola. Additional handsets and product families should follow, along with a strong push for mobile applications running on the Android platform; apps will come both from Verizon and Google as well as third-party developers. Google and Verizon have a rather contentious history, recently coming to a head over the 700MHz spectrum auctions that provide frequency space for forthcoming LTE services; Google put $4.6 billion on the line in an effort to ensure openness for any device, content, application, or service. Verizon, in turn, attempted to brand itself as an open network via an “Any Apps, Any Device” plan that would let customers use non-Verizon devices and applications on their network…so long as those devices and apps met Verizon’s specs. After Verizon came out the big winner in the 700 MHz spectrum auction, Google stayed on their case to force the company to comply with the openness principles the FCC actually put in place. Now the companies seem to have found common ground in Android—and while specific announcements will happen in the near future, Verizon is explicitly saying it will support Google Voice on Android devices. Industry watchers point out that the tie-up between Google and Verizon has deep ties to mobile advertising, a burgeoning field where both Google and Verizon want to be major players. If the companies can put enough Android handsets on Verizon into consumers hands, both companies will certainly be looking to sell behavioral-based advertising to those mobile users.